Okay okay, I know I over exaggerated the title. Obviously, an all-expenses paid trip to a 7-Star Hotel in the Maldives for your honeymoon beats your photo booth album, but allow me to make my case for magic of the photo book. For some brides, celebrants, and event planers, the Premium Guest Book Album is the #1 reason to hire a PhotoBooth for events. The PhotoBooth Guest Book is an awesome keepsake that you will cherish and will be a beautiful vivid reminder of THE people and THE love at your special event. You ask what’s so special about the guestbook album? See her entire blog here – photo booth is a hit. Over the past few months we at PhotoGenic PhotoBooth have had the awesome pleasure to put smiles on the faces of our clients by presenting them with their PhotoBooth Guestbook photo album immediately after the reception. 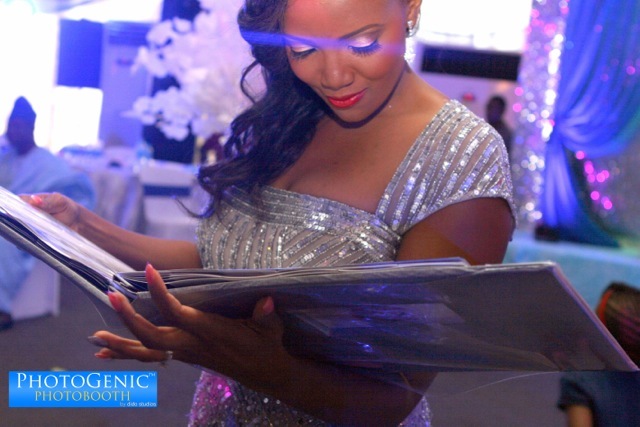 Lolade, one of our beautiful brides, tells Wale, our senior manager, how she really feels when she receives her photo booth album in this short clip. Okay, I know you are still thinking about the white sands and green-blue waters of the Maldives honeymoon, but I hope a part of you is now looking forward to getting a priceless piece of memories that you will cherish for years to come after your wedding and honeymoon. Enjoy some of the magical moments we’ve captured around the photo booth Guestbook album (especially the appreciative smiles). Guests Love to Tell You How Special You Are. Let them! It never gets old. The PhotoBook might truly be a Bride’s Favorite Gift. We didn’t forget the Groom oh. They also love the Photo Albums. This is awesome!!! We had so much fun at the wedding. Hope to see u guys again! My fiancé will love this …. what is cost of your service? Can I find that information on your website?